North of Narrabri: Thanks, Mary. . .
As I pack cameras and clothes for this week’s flight to Australia, I have to say that none of this would have been possible without the support of my wife, Mary. She never questions (at least out loud, or at least to me!) my sanity in wanting to travel halfway around the world—without her, without the rest of the family--to look at trains, of all things! She never complains about the time I spend corresponding with new friends down under and learning about Australian railways. And she doesn’t give me guff for all the hours I’ve spent so far building a little bit of the NSWGR in an upstairs room, often at the expen se of time that I should’ve devoted to playing with our two boys. I guess that means that, on the whole, I’ve been a good, (somewhat) attentive and always loyal husband to her, and a loving daddy to the kids. There’s never enough money to take care of everything around the house that needs attention, of course, nor to give the boys everything they deserve, let alone need. But Mary has always been supportive of my crazy pursuits, and I in turn have tried not to take advantage of her good will. Lord knows going to Australia for two weeks isn’t a cheap proposition, but Mary hasn’t complained about the few hours a week I spent earning money for the trip through my “second job,” so it wouldn’t add to family debts and take away from my providing for the family. I certainly won’t forget that while I’m in Australia, having a great time, exploring a wonderful land, meeting new friends, seeing a whole new continent and being introduced to Touhey’s and mushy peas, Mary will be back in the states, working as tirelessly as she usually does, getting the kids to and from school and baseball practices, feeding them (and picking up after their messes), doing the laundry, the shopping, and the cleaning. Hopefully she’ll find time in there to take my Skype calls! Why am I saying all this on a model railway blog? Partly so she can know what I sometimes don’t express in words to her; partly so I can just get these thoughts down on how lucky I am to have her in my life; and partly so perhaps some of the other guys reading this—if they’re half as fortunate as I am-- can nod their head and agree that many of us couldn’t get by without the love and attention of our wives. Thanks again,chickie! I love ya! I would just like to second what Blair has said; I am looking forward to meeting Blair (and Lance) next Saturday and also have a very understanding wife who has put up with me being a bit overly focussed as I prepare Bylong for Blair's visit. So again, thank you from Oz. Thank you, Ray. And thank you to all those of you opening your doors, offering your help & your time to welcome Blair (and Lance) to your country, your home & your lives. I know they will never forget it & always appreciate it. Thank you Blair, my BFF (lol! ), my love, my partner in life. I'm as excited as you are about your adventure and I can't wait to hear all about it when you come back... your dreams & those of our little boys are my dreams too and will be there to support them especially when I see the hard work you have put into to make it a reality and b/c I know that when I decide to pursue one of my dreams I will also receive that kind of support too... AND as long as you bring me a didgeridoo back you know I'll be a happy camper. Ha! Hey Blair, Keith Jordan told me last month that you'd left Walla Walla for the Land Down Under as modeling inspiration, but I'd not expected it to be literally so! Sounds like an exciting journey. I'm looking forward to seeing your blog when you return to Texas. 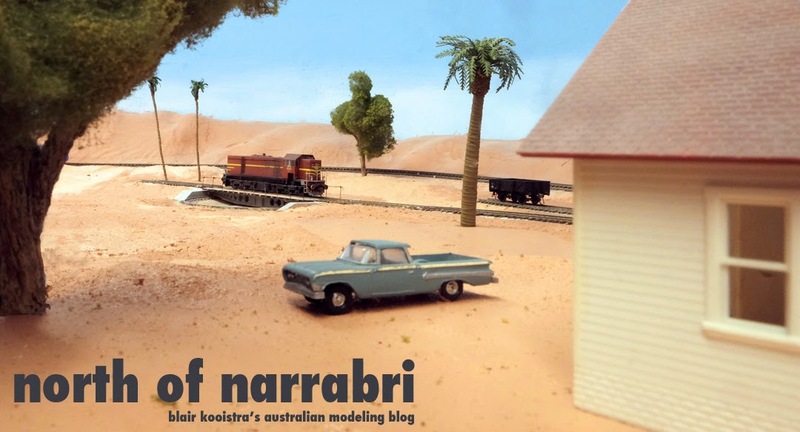 I almost struck the Aussie bait about 10 years ago when I came across some issues of Australian Railway Modeling mag (think that was the title). Neat stuff! Ironically, I made the dive headfirst last September into modeling British Railways ca. 1950s. A long-cherished notion is coming to fruition. It's a challenge, as everything is "over there", as you well know, but I'm getting lots of help from folks in the UK via RMWeb. Still installing new signals (and maintaining them when my seniority lets me) on the ol' BNSF! Professional train dispatcher, amateur photographer. Finally old enough to wow people with boring photos that are now old enough to be interesting. To Oz and Return. . .
CAI Leasing CMA CGM 45G1 - CAI containers are normally bright red, but this one is leased to, and painted for CMA CGM. The box is CAIU 969845-0 and is a 45G1. Enjoy!